Anyone can encounter an aggressive driver on the road. It is important to stay calm and keep driving safely. Ever encountered someone driving head-on in your lane at 70mph on a highway with one lane in each direction? These drivers are the reason why we often get nervous approaching a slight hill or a curve. Although the highways are being widened now, many precious lives have been lost during peak holiday season traffic. While most drivers on our roads are courteous and law-abiding, there are some careless and distracted drivers who can cause a road rage induced car accident. It is not difficult to lose your calm when you see a speeding driver weaving in and out of the traffic or someone tailgating while talking on their cell phone. Who Is Most Likely to Display Road Rage? Speeding: Excessive speed is the most common and dangerous form of road rage. According to the Federal Motor Carrier Safety Administration, speed causes a third of all traffic fatalities. Tailgating: Following too closely is a leading cause of car accidents. In one study, 62 percent of respondents claimed that they were followed too closely. Lane changes: Sudden lane changes can prove dangerous, especially in traffic. Speeding can make matters worse. Gesturing: Using obscene gestures can be dangerous. Sudden braking: Braking suddenly can be deemed confrontational and can lead to aggressive driving. Therefore, you should never try to brake suddenly to teach a tailgating driver a lesson. Leering: It is important not to make eye contact with an aggressive driver as it can prove risky. Flashing lights: Aggressive drivers can flash their lights at the fellow driver. Anyone can encounter an aggressive driver on the road. It is important to stay calm and keep driving safely. Here are some common sense ways to avoid an accident with aggressive drivers. If you are being tailgated or someone cuts you off, you should keep calm and stay out of their way. By responding to road rage, you may cause an accident. Do not pull over to speak to an aggressive driver. Unless you have caused an accident, do not pull over. Call 911 and take precautions to protect yourself from the angry driver. 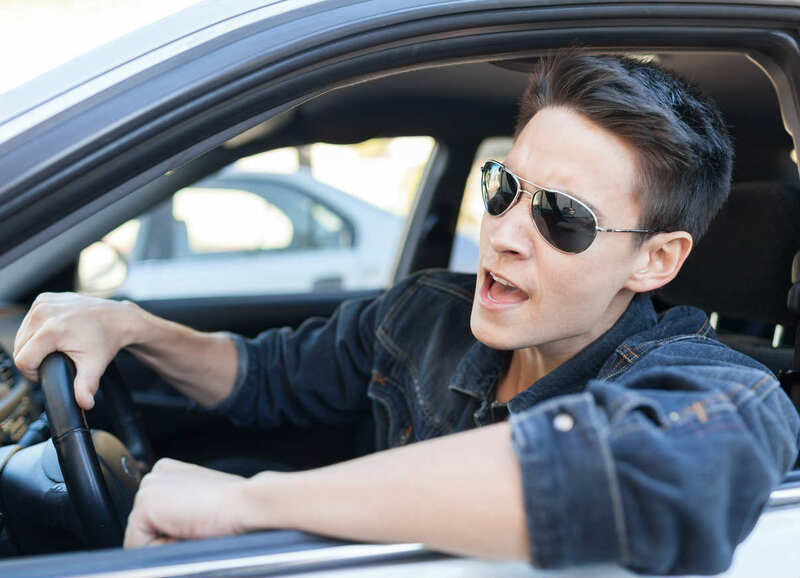 If you see an irate driver on the road, who is behaving dangerously, you should call 911. Injured by an aggressive driver? Seek help from a competent St. Louis car accident lawyer. Call The Hoffmann Law Firm, L.L.C. 24/7 at (314) 361-4242 for a FREE case evaluation.